Welcome to Daydreams of Quilts’ day in the My Happy Place Row Along. I am thrilled to be able to share my row with you! My happy place has always been the mountains in Jasper National Park here in Alberta so of course my row had to depict something from there. I chose Pyramid Mountain at Pyramid Lake for the subject of my row. I am so thankful to Northcott Fabrics for sponsoring the row along and providing fabric to all of the designers. The fabrics in my row are from Northcott’s Naturescapes line. These fabrics are available in quilt shops now. Mountains Applique Quilt Row designed by Daydreams of Quilts using Northcott Naturescapes fabrics and Kona for the lake. Below is the photo I used for my design. This was taken during a family hike in May 2017. It was a cloudy day so the lake looks grey but on sunny days it can have a bright turquoise colour. I used Kona for the lake in my row. Pyramid Mountain on Pyramid Lake Jasper National Park, Alberta Canada. Here is another photo of Pyramid mountain as seen from another favourite spot on Lake Edith in Jasper National Park. Pyramid Mountain as seen from Lake Edith. Marian, the host of our row along, has lined up many prize sponsors. Click here to enter today’s giveaway on the Rafflecopter! Opens September 27th and Closes October 4th. Today’s giveaway prize is Tuscany Supreme Cotton batting twin sized. A $30 US value. This prize will ship worldwide from Hobbs Batting. Product descriptions for all the giveaways can be found here. This giveaway has been sponsored by Hobbs Batting. Thank you so much to Marian and all the My Happy Place Row Along sponsors! Have fun sewing! Mountains are my happy place too – different mountains in a different part of the world, but there is just something about seeing something so old and majestic! Your row is lovely and very tranquil. Makes me feel like I’m there in the mountains. Wonderful row! One that I definitely want to make in the future. Thanks for sharing. Great design work. Love your row. Thank you! The mountains truly are gorgeous- and that comes through in your pattern. This is a lovely row – beautiful photos of your happy place. Your row is fabulous!! You have captured it perfectly. Great job!! I love mountains. We’re near Shenandoah Mountains were we go camping at least once a year. Gorgeous likeness of your beautiful area. Love how that tree fabric works so well in this. beautiful row, makes me want to go to the mountains somewhere. there are no mountains in south texas. Thank you for letting us visit your happy place. I’ve always wanted to travel to that area. Fabrics were perfect for it. Love the mountains. I’m thinking two or three in a row would make a great pillow for the couch. What a lovely memory to recreate for your row! I love the mountains! Beautiful row! Thanks for taking the time to create and generously share your row! I grew up in the mountains and your row makes me long to go back home. Thank you. What a pretty row you have designed! And the fabrics you used are perfect. What a simply beautiful depiction! I love how you allowed the fabric to help tell the story with such simple shapes. Your work is incredible. Thank you! Wish I was there! Thank you for sharing. Jasper is one of my favourite places too – just wish we lived closer! I love your Happy Place and have many fond memories of camping and hiking there when my kids were young. Love your row and thank you for being part of the hop. I really enjoy the chance to meet new to me Canadian bloggers. I just got back from a quilt retreat in the mountains near me…not as pretty as yours but still wonderful to visit. Add me to the “mountains are my happy place” club! Different mountains by the looks of it! Thanks for a great row! I so want to pack up and just leave again…ahhh…mountains…thank you so much!! I think I would enjoy your happy place too. It looks so serene and peaceful. Thanks for sharing your row! Row is so peaceful and beautiful. Thank you for sharing. Thanks so much for being a part of the Row-Along! I love the mountains too, but have never been to those in Canada….maybe someday. Our mountains are a happy place too. Mountains somehow transcend cultures and times to remain popular always. Your happy place looks lovely. Thanks for the block. I live in Alberta too, and I love to go to Jasper National Park as well. The mountains are just spectacular! Thanks! Your row is beautiful, I feel the calm and tranquility! Beautiful row! Thanks for sharing! I love the mountains. Thanks for sharing your row and pattern. Hello from a fellow Canadian! Love the way you used your northcott fabrics, very effective. What a beautiful place! I’ve always wanted to see the mountains–one day I will! Thanks for the pattern. Amazing mountain row creation from a photo & thank you for the pattern. Very nice row pattern, thank you. Your photos of the mountains are wonderful. Your mountain photos are beautiful. Thank you for the row pattern. I LOVE your row with the curved lake & road. So very interesting. What a wonderful row. It reminds me of some pictures Alyciaquilts has been posting on IG lately, of Colorado. Thanks for a great row pattern. I love the mountains! What a beautiful row. Thank you for sharing it with us. Looks like the mountains are a wonderful place to go. Thanks for sharing. A lovely row and perfect for the Alberta area. I’d love to drive along that winding road and see the beauty of nature… I bet it’s gorgeous. I have enjoyed having you in the row along Anita and seeing you build your beautiful row. Thank you for participating and I hope you’ll come along for our 5th year next year. 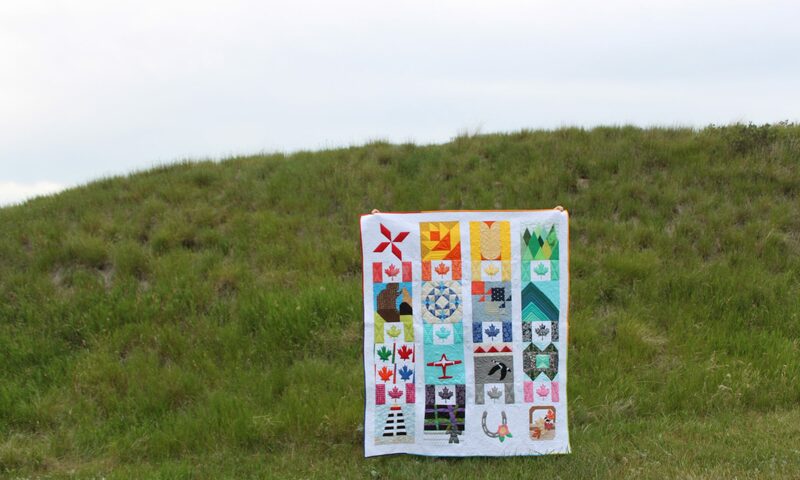 I visited Jasper National Park once and your beautiful quilt brought back wonderful memories. Thank you! A breathtaking row design! Thank you so much. I love the mountains. Thanks for the pattern. Such a pretty row! I love the Canadian Rockies.